The Last Organic Outpost is a nonprofit farm and social entrepreneurship incubator, based in Houston’s 5th Ward. Photo courtesy of Last Organic Outpost. Joe Icet has a message for humanity: the world is in sad shape, and we’re here to lift it up through sustainable agriculture. His friends have even dubbed him a “land evangelist” because of his passion in talking to students and community members about the power of positive land stewardship. 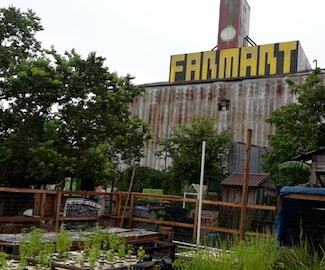 “This is the ‘Disneyland of Sustainability’, haven’t you heard?” he asks as he guides visitors around a slightly hidden farming campus in Houston’s Fifth Ward residential neighborhood. This retired union pipe fitter has made sustainable and organic farming his life’s mission. He founded The Last Organic Outpost, a nonprofit farm and social entrepreneurship incubator, in 2004. Since then, he has built up a thriving community education program and urban farm on less than two acres of land. The Last Organic Outpost, or LOO, combines a production farming model with an agricultural entrepreneurship program. Community members plant and tend crops on the one-and-a-half-acre farm, while Farm Dirt, a for-profit compost company, uses nine-tenths of an acre to turn 100 tons of food waste into premium soil. Icet launched the LOO using his own funds and has supported the endeavor through partnerships with like-minded community members and companies willing to provide in-kind support. They launched a grassroots fundraising campaign and asked the community to commit to donating $1 per month. Icet said this gives every member an opportunity to be invested, even if they don’t have the economic means for large donations. The LOO and Farm Dirt are solely sustained by the community. Icet is quick to point out the organization has never received funding from foundations or grants. The entire campus is built with volunteer work hours and in-kind donations. The food waste that powers the composting comes from a partnership with Houston Independent School District, which donates all the food waste from four area schools. The wood chips that are spread across the field to nourish the soil are donated by CenterPoint Energy tree removal services. More than $18,000 in building materials, such as wood and fencing, were donated by Lowe’s Home Improvement. And the land itself is farmed by a group of families in the neighborhood who emigrated from several African countries. The result is a truly grassroots effort where Icet says people come together to learn about different farming methods and vegetables grown in different cultures. Volunteers have built and maintain a 4,500-gallon water catchment system, an 11,000-gallon fish tank that’s used for raising tilapia, a 550-gallon biological filter made out of a reclaimed hot tub, a chicken coop that houses 40 hens, a collection of bee hives, and an extensive aquaponics system. There are also vermiculture beds that provide a revenue stream through community starter kits and earthworm casings that are used for compost tea. Icet said he isn’t out to make a profit with the LOO. His goal is to create a community gathering place founded on urban self-reliance and an agricultural testing ground where people can come together, share ideas and experiment with different sustainable agriculture models. Community classes are held at the LOO featuring everything from how to raise hens to how to get started with vermiculture. Sustainable urban renewal is something Icet feels deeply passionate about. “I’m here to create impact. I don’t want to spend however long I have here saying, ‘I just ate, went to dinner, watched a few movies and created nothing,’” he said. Instead, Icet spends his days nurturing relationships with community members and companies who share his passion for urban renewal and agriculture.